Experience Copenhagen the best way: by bike. You can bring your own bike or rent one from us! The guided tour lasts 2,5 hours and begins at 11 am and runs every Mon, Thu, Fri, Sat, Sun, days between 1st April and 30th September. See some of the highlights and must-sees of Copenhagen. Enjoy some insights you didn’t know about and feel free to ask the guide. We are experienced in guided bike tours. You will be sure to have a great time with us. This private guided tour is designed for you and anyone you would like to share it with. We offer guided tours by bike or on foot. The route can begin and end wherever and whenever you like. We always can adapt our tours by group size and places to visit. Everything is possible! Order the tour online or by e-mail at info@copenhagenbicycles.dk. If your tour consists of more than 40 people, please write us an e-mail. Copenhagen Bicycles can arrange guides in English, Danish, German, Spanish, French, Dutch and Italian. Book a group guided tour here. We can customize your needs if you are a large family, school class, company or groups of friends. Our guides can handle up to 20 participants per group. You can always feel safe with us. We look forward to showing you our city in the way you prefer! We may be forced to cancel if our guides are scheduled for other tours. Booked payments will be refunded. English, Danish, Scandinavian, German, Spanish, French, Dutch, Italian. On this tour, you will learn more about his life, his writings, his travels. 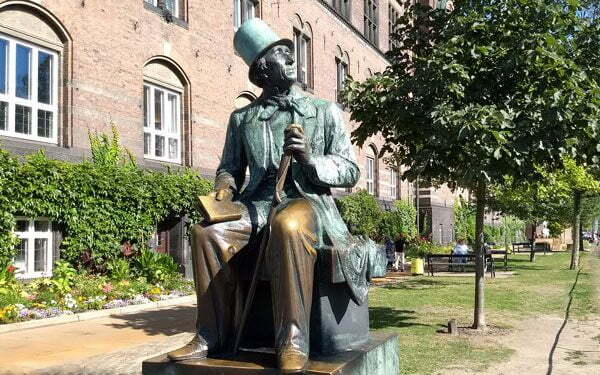 We will visit The Little Mermaid, Statues of Hans Christian Andersen (or H.C Andersen as we call him) and pass houses where he has was living and his crave on Assistensens Churchyard. Duration About 2 – 2½ hour. 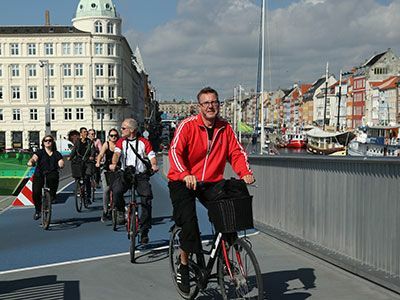 Can you imagine biking around town and discovering Copenhagen with a chef? You wouldn’t believe your imagination, a chef on a kitchen-bike bringing everything he needs to serve a unique dinner whilst going through the hidden gems of the city. 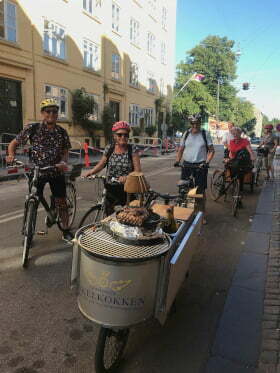 Well, in Copenhagen it is possible because the Bicycle Chef has combined his profession as a chef with his passion for bikes to create and prepare delicious food anywhere – garnished with stories from the places you will see and experience. Various dishes and drinks for lunch will be served at beautiful locations throughout the city. You will be introduced to food that is based on the seasonal ingredients and locally produced. On this trip you will taste the modern gastronomic kitchen with various food trends. When: Every Tuesday at 11 am. Where: Begins and ends at Copenhagen Bicycles, where you will get your bike. 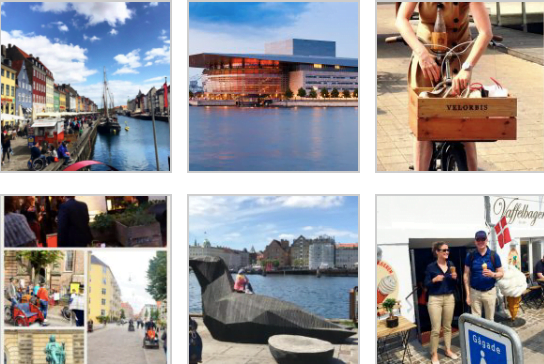 Who: This tour is perfect for anyone seeking that local Copenhagen feeling, loves good food and wants to explore Copenhagen with the locals. Begins and ends at Copenhagen Bicycles, where you will get your bike. Visitors who would like insider tips and to experience Copenhagen the local way. Inspiration on where to wine & dine and have a coffee, after the guided tour. Also perfect for visitors who have been in Copenhagen before and want to learn more about the city. The tour includes a City Bike or you can bring your own bike! The guided tour lasts 2,5 hours and begins at 12 am every day between February 1st – September 30th. We can only complete this tour if we have more than 5 participants, where we, unfortunately, may be forced to cancel, booked payments will be refunded. You will get to experience Copenhagen in the way the locals do when CPH BLONDE reveals hidden gems and what it’s like – really – to be and live like a Copenhagener. CPH BLONDE is a rewarded blogger whose blog has been voted world’s best lifestyle blog about Copenhagen. She was also chosen by CNN International to participate in their TV series” The Perfect City”. Take advantage of her knowledge about the city and insider tips, and join her for a unique Copenhagen experience. Enjoy for instance finding out where to get the best croissant in town, the coziest place for a drink, the best view of Copenhagen (nope, it’s not The Round Tower) – and the best restaurants, where the locals go. 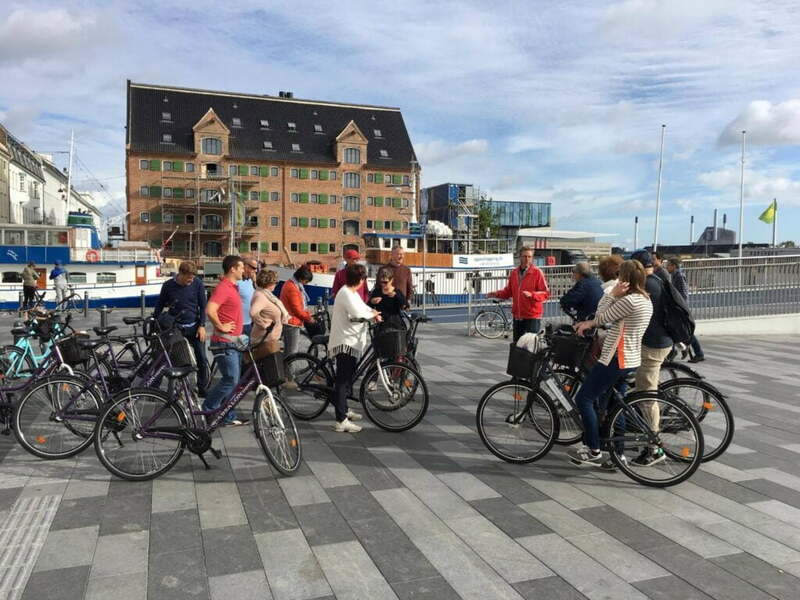 The price for the daily guided tour for 2,5 hours is 450 DKK per person including city bikes. You are very welcome to bring your own bike or rent one at our shop. You can be sure we cover Copenhagen City, Vesterbro, Latin Quarter and Freetown Christiania – other than that be prepared for a nice local” freestyle” experience, according to the personal requests from your group and what’s currently happening in Copenhagen. 12:00 - 14:30 February 1st – September 30th. Learn how to become the perfect cyclist and bike safely in the busy Copenhagen streets. Sign up for this guided tour, experience the urban atmosphere as a local and learn how to move around the city on two wheels. Get training in cyclist traffic rules. Avoid traffic accidents and fines from the police. Become familiar with the geography and most popular neighborhoods. Practical knowledge: Get to know the great shopping and dining places. We can only complete this tour if we have more than 5 participants. We may, unfortunately, be forced to cancel when the group is smaller than 5 and payments will be refunded.